The Bolivian opposition leader, Evo Morales, has called off a series of blockades that have prompted a political crisis in the country. 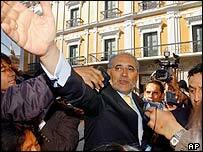 Mr Morales eased the restrictions after Bolivia's lower house of congress raised taxes on foreign energy firms. He described the new law as a "middle ground" between the demands of the opposition and the policies of embattled President Carlos Mesa. Mr Mesa, who offered to quit last week, has called for early elections. Mr Morales, who leads the opposition to Mr Mesa in parliament and also represents Bolivia's coca farmers, was the driving force behind the protests. His call for nationwide roadblocks, widely supported by Bolivia's majority indigenous population, have virtually crippled the national economy in recent weeks. 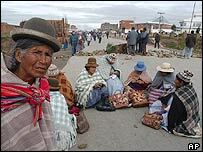 Key to the protests was a demand for higher taxes on foreign energy companies exploiting Bolivia's vast natural gas reserves, which are the among the largest in the western hemisphere. As it stands the new bill - which still requires approval by Bolivia's Senate - raises taxes on profits from 18% to 32%. That remains some way short of Mr Morales' initial demand for a 50% levy. Nevertheless Bolivia's Energy Minister, Guillermo Torres, described the bill as "economic suicide" for the country. The BBC's South America correspondent Elliot Gotkine says Mr Mesa's immediate future remains unclear. The end of the blockades could persuade him to change his mind yet again and stay in power, our correspondent suggests. However, after failing to make good on his threats to leave office, analysts believe his position would be severely weakened, he adds. Last week Mr Mesa offered to resign in an attempt to break the deadlock with his political opponents, but his offer was rejected by parliament. On Tuesday the president called for early elections, a move that would essentially end his four-year term of office two years early. As the incumbent, Mr Mesa is constitutionally barred from standing for another term.